Wheel bearings are often not on the important fifthwheel feature shopping lists for the ladies. However, should a bearing fail, out in the middle of no-where, the correct fifthwheel bearing selection suddenly becomes paramount. Base on our customer’s experiences, over the last 38 years, here’s what we have found. Chinese made bearings. We really love those friendly folks from the Orient. The Japanese, years ago, mastered the art of copying American products. The Chinese have not copied American products quite as long as the Japanese. They have come up a bit short in their attempts to make quality wheel bearings. The bearings look the same but fit and durable quality still lack. Often “knock offs” don’t hit the target. Installing wheel bearings is as much an art as a skill. Correctly, lightly, torquing the castle nuts to assure proper side loads can and is often not as precisely done as required. To little torque or too much torque on the castle nut, can produce lots of heat and/or very unusual wear. Above - a basement compartment doors , in open position. All three compartment doors: front and two side doors open with pass through/see through, easy storage space access. Now that you know to look, we are sure you will see oil bath outer wheel bearing on the big cross country semi-trailers. Fleet operators have found that oil bath bearings run cooler and reduce moisture contamination. Just limiting moisture contamination is a really big contributor to long bearing life. 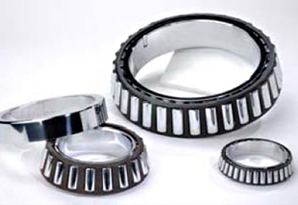 And oil bath bearings do not need to be “re-packed” on a regular basis, as is required for greased bearings. In keeping with Americana’s policy for the need to maintain smiles on our customer’s faces, these top quality USA produced Oil Bath outer wheel bearings, are now standard equipment on all Americana 5th wheels. The confidence these bearings represent long out weigh the price factor.